Holds both round and rectangular. 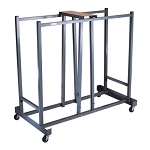 Easily store and move your Lifetime brand tables with this 80339 storage cart. 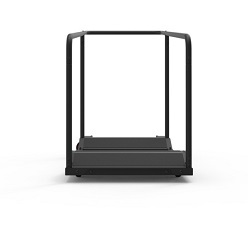 Completely redesigned from the previous model, 6520, the 80339 features a ramp up to roll round tables up onto the cart more easily and a push and pull handle on one side to more easily direct the cart. This cart can store any 4, 5, 6, or 8-ft rectangular table from Lifetime and 46, 48, and 60 inch round tables as well. You can also store Lifetime card tables as well. 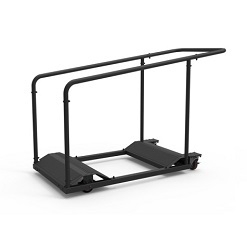 The 80339 cart is made out of powder-coated steel tubing, which provides superior strength and stability while moving tables around. Easily moves 11 8-ft rectangular tables. The cart moves on 4 2.75 inch casters, 2 locked and 2 swivels. Includes a 2-year warranty through Lifetime Products for customers in the United States and Canada. This cart is the same design used for many years from Lifetime Products. Thus, the dimensional capacity has not changed. However, the capacity of Lifetime Tables has changed. The old round-table design for the folding legs used to allow only 7 round tables to fit into this cart. Lifetime Products has since redesigned the legs, which now allows the 6520 table storage cart to fit up to 10 Lifetime branded folding tables. This cart is unable to support the 72 inch round folding tables. For help with storing the larger Lifetime Tables, please see our Lifetime Heavy Duty Cart 80193, the Mity Lite Table Storage cart, or our National Public Seating Table Storage Rack. Both of these carts can support the larger diameter tables. 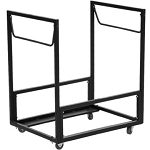 Get volume discounts on Lifetime table storage carts. Model: 6520 Great transaction. Quick delivery and I'm very pleased with the product! Model: 6520 GREAT product! WONDERFUL value! Model: 6520 Thanks! Loved the product! Model: 6520 Good price and great customer service. Would buy from again. Model: 6520 In searching for furniture for a new church building, I found your site by Googling for Lifetime Tables. Dealing with your company was easy, very satisfactory, and a pleasure. Model: 6520 Great communication and quick service! Model: 6520 Unless you want to build one of these carts from scratch on your own, nothing beats having one purpose built. It rolls well on smooth surfaces, but not so well on bumpy ones. Forget about loose gravel or rocks. Puts together with simple hand tools. 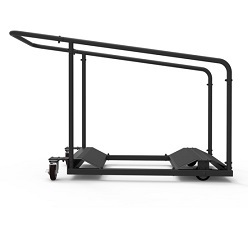 Q: Can you ( or I) install little caster facing sideways on the bottom rail, to roll along a 6" vertical rail edge under our performance stage? We would be putting at least two carts in each slot. A: unfortunately, it is difficult to replace these casters since they are recessed in the front. You may be able to replace the back ones, but we do not sell any type of castor other than the caster that's on there. Q: Can the table cart 80339 hold a combination of rectangular and round tables or will it only hold one type or the other? A: Yes, it can hold rectangular and round at the same time. You can mix-and-match the size of the rectangular tables and it holds round tables up to 60 inches. This makes it versatile and it can hold brands other than lifetime. Q: what is the shipping charge to a school located in Brighton, MA 02135? A: The shipping is around $35. Q: How many 8' Lifetime tables does it hold? A: I purchased for wooden rounds vs the plastic and it holds only 8 but a fabulous product! Q: can u=you use 8 foot tables for your table hauler? A: It will fit 8' rectangular Lifetime tables. This cart can store any 4, 5, 6, or 8-ft rectangular table from Lifetime and 46, 48, and 60-inch round tables as well. This cart cannot store the 72-inch round table size from Lifetime. You can also store Lifetime card tables as well. If you are wanting to use it for a different brand of table, then it will most likely work, but we can't be sure. Q: Will this hold wooden tables, and how much weight will it hold? 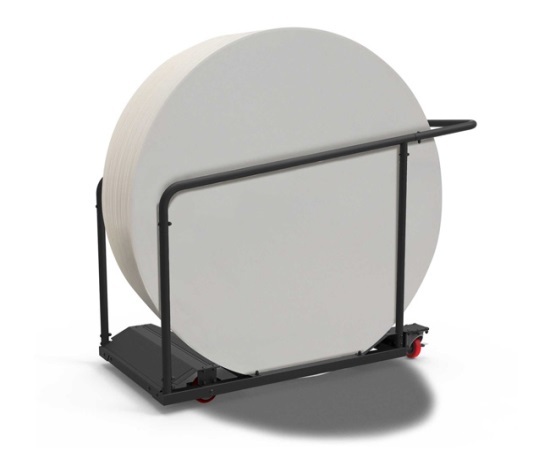 A: The cart has the capacity to transport 10 60" round Lifetime plastic tables, it will not work with wooden ones; however, the DY60R is made to carry wooden tables. Q: I have 10 8' plastic rectangular tables. Is this product designed for them. Can a small woman load it and unload it alone? A: Yes, a small woman should be able to unloaded and loaded by herself as long as she is capable of unloading the 8 foot tables which weigh about 45 pounds each. I'm assuming you have plastic tables? Otherwise, if they are when they are closer to 90 pounds each. Q: What are the dimensions of the cart? A: Why does the picture of the 6520 show a width of 26 3/4" while the descriptions width is 32 3/8". Looking for narrow carts to get through doorways. 32" is too wide. Q: Do you still make model 6520? A: Model 6520 is obsolete and was redesigned and replaced by this model 80339. Q: How many wooden round 60 in diameter tables can this cart hold weighing about 50-60 lbs each? A: Unfortunately, this table cart is not designed to hold the wooden tables. I'm sorry for the bad news. We do have a card that can hold them just fine and that is model "CartN". 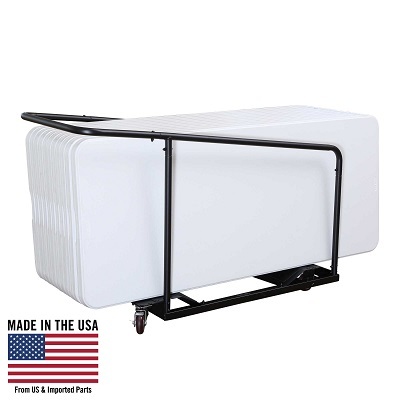 If you type that search term into our website it will pull it up and that is a very heavy-duty cart-heavy-duty enough that if your tables can fit on it it can handle them. Feel free to contact us with any other questions. Q: We have the older heavier 60 in diameter tables. What weight capacity can the caster hold? Plan on putting 7 of these tables on it. A: This card is designed specifically for those older and newer 60 inch diameter tables as well as rectangular tables. You could fit 7 on it very easily. I'm assuming you are talking about the plastic tables. If you have wooden tables that is a different story. Dimensions: 52" x 25" x 6"